A popular pasta shape in America and many other countries across the world, shell pasta is a must-have addition to any kitchen. Shell pasta features a small, hollow, seashell-like noodle with small ridges along the exterior and is a great complement to a variety of sauces. The hollowed curve holds onto creamy and hearty sauces to ensure maximum flavor in every bite. Use this shell pasta to create pasta salads, stir fry dishes, soups and stews, or put a unique twist on the classic macaroni and cheese. No matter what you're serving, this versatile pasta will bring authentic Italian flavor to any dish on your menu. Best of all, this pasta is simple to prepare. Bring water to a boil on your stove top and add a pinch of salt. Then add in the shell pasta and stir gently. Bring the water back up to a boil and let it sit on the stove uncovered for 10-12 minutes, with occasional stirring. Afterwards, strain the pasta and it's ready to serve with your signature sauce. Or run it under cool water and create a pasta salad bursting with fresh flavor. Making fresh pasta noodles from scratch can be rather time-consuming, especially when you've got a busy kitchen. Dry pasta will help to cut down on preparation time, ensuring a smooth and efficient service for your hungry patrons. Simply rehydrate in boiling water! With 20 lb. 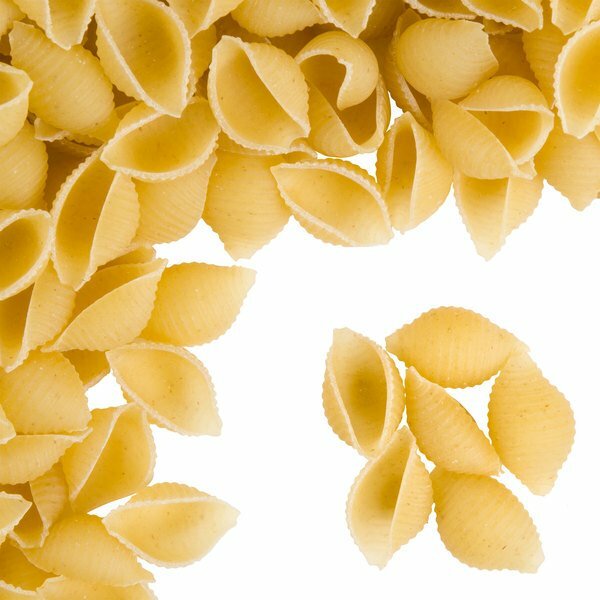 of pasta in every case, your restaurant will be in good supply when making one of your popular dishes that feature shell pasta. Al dente or soft, drizzled with olive oil or covered in sauce, this shell pasta is the perfect all-purpose item to satisfy your customers. I use shell pasta for my 2 cheese Mac-n-Cheese and recently was turned on the webstaurant store for great supplies. I've orders some kitchen supplies so decided to give this pasta try. The description does not describe the shell size and I'd certainly call them small shell. I prefer medium normally. I used a pound today for an experimental new dish and they were easy to use and cook good. As good or better than many others I've used. I'll use them for my next event in Mac-n-Cheese and if they work as good in that as today's dish I'll be switching to smaller shells. The 20 lb. Bag Shell Pasta is great for pasta salads and soups! It's really hard to find good pasta for soup, we were very happy with these shells! This shell pasta is great for making homemade macaroni and cheese. It comes out tasting better than anything else I've tried. The pasta holds up well with the cheese and does not get soggy. Nice shell pasta that is great for making our tuna pasta salad. Love the shape and texture of this pasta. Cooks up quickly and perfectly. Shell Pasta - 20 lb. from WebstaurantStore is good for macaroni and cheese or with thicker sauces. It cooks well and brings a unique pasta texture as well. The 20 pound bulk bag of shell pasta is great for making trays of macaroni and cheese. The shell design adds texture and has a classic pasta flavor. 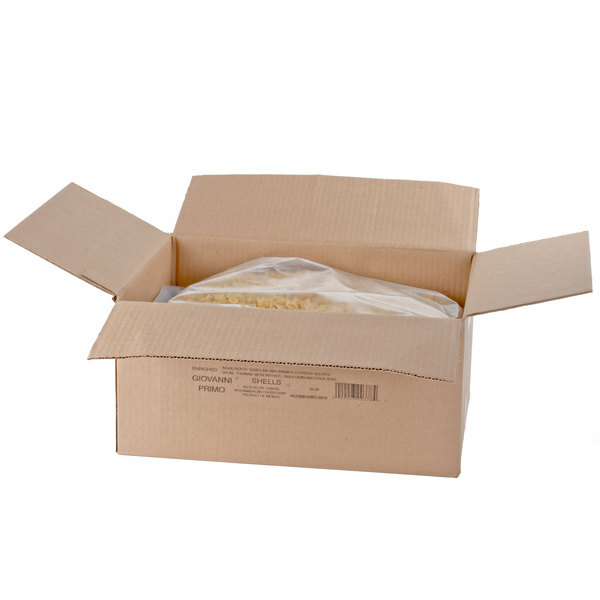 The 20 pound case of Shell pasta is good for making macaroni and cheese. These are a good alternative to the elbow shaped macaroni for this purpose. The shell pasta is great and perfect for making our shell and cheese. The shell pasta is also great for our seafood restaurant and shrimp pasta dishes. Shell pasta is good for noodles added to soups. It is especially tasty when covered in a creamy melted cheese sauce of a various cheese blend. Shell pasta - 20 Lb is a great tasting pasta at a great price. Fast shipping and easy ordering makes ordering this pasta a no brainer. We have used this pasta in salads, itallian dishes and with nothing but butter and parmesan cheese. you won't regret ordering this product. i was a little concerned that the taste would be cardboard like or something undesirable because of the great price, but my fears were unfounded. the taste is great and my dishes turned out just as yummy as they have with a more expensive brand of pasta. Will buy again! Great product at a price that can't be beat. Even considering the shipping costs, it's still a bargain when you consider the quality vs the generic brands available in the supermarkets for more/lb. These are nice, medium shells, that make the very best shells and cheese. All of Web Restaurant Store's pastas are made with high-protein semolina wheat, cook quickly, and taste great. This cooks up just great and is a great ingredent in our three cheese mac and cheese. It holds up well during the baking time as well as on the buffet line. We purchased this for home use with our large family. Everyone enjoyed the taste! Excellent quality for the price, and quick shipping. Definitely will purchase again. We go through this pasta almost faster than any other kind. We make a vegetable and shrimp dish that we sell in bulk that is a very hot seller.